This page is an "Apartment 3G" Sunday strip, published on January 31, 1965. It is signed by Alex Kotzky, though Kevin Altieri, my director on the Stripperella TV series at the time I acquired this page, insisted it was ghosted by Frank Springer. Frank Springer drew "The Adventures of Phoebe Zeitgeist" for the Evergreen Review during this same period, so one can compare and contrast. I suspect Kevin is correct; upon closer study this page doesn't appear to be by Kotzky, or at least not inked by him. 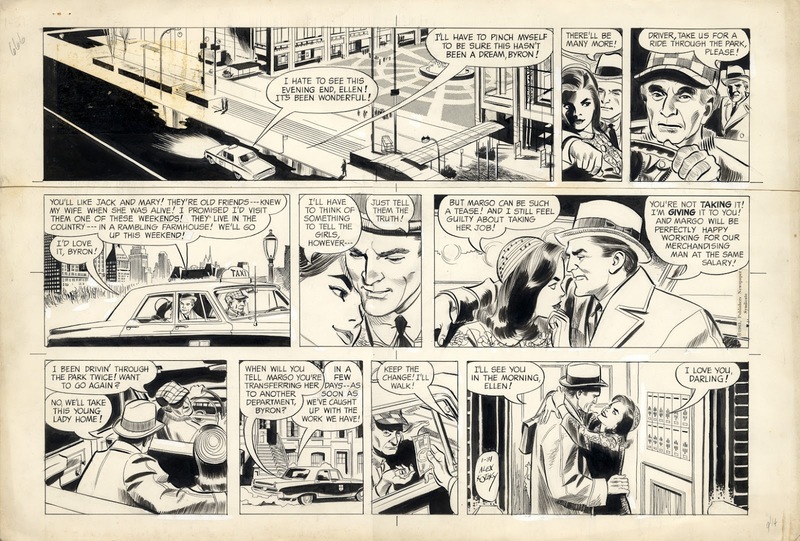 The artist, whoever he or she is, seems to ink mostly with croquille pen using brush only to fill in blacks; Kotzky was more of a brush guy. 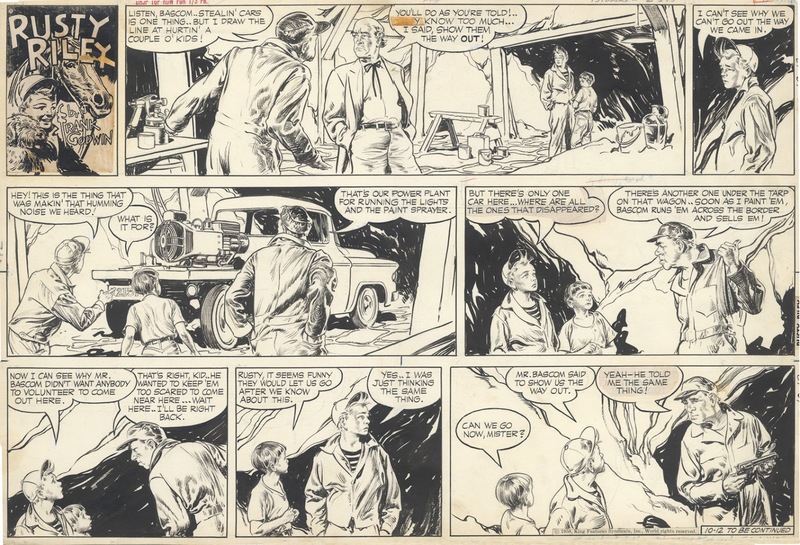 It's magnificent nonetheless; I love how the artist inks the BGs without using a straight edge. giving the art an airy, light feel I wish I could achieve in my own work. Basically I bought or traded for this page because of the background inking, the way the forms are simplified and abstracted so that they work as black on white to reproduce properly for the cheap newsprint. I especially love the first panel. This is a Rusty Riley Sunday page by Frank Godwin, from October 12, 1958. The original is huge, 16" x 23", on thick paper. 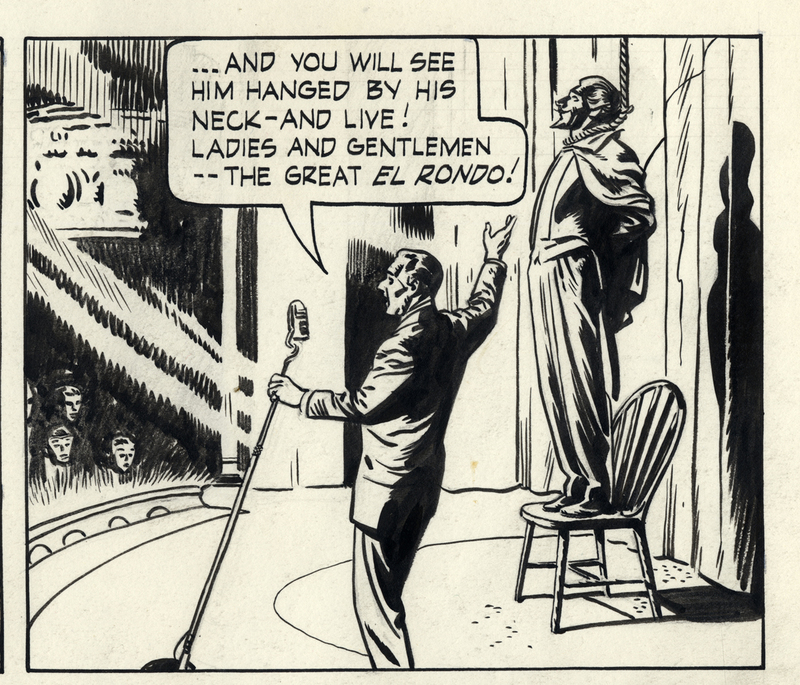 I acquired it to bliss out on Frank Godwin's inking technique, since the staging is rather pedestrian. I'm especially enthralled by the third panel because of the ink work on the man's arm as he stands, back to camera, hands in pockets. Godwin HAD to be working from photographs. 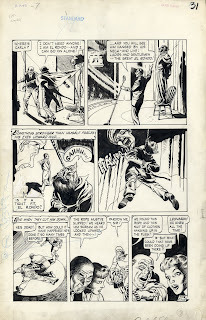 I find it interesting to compare Godwin to Al Williamson, another photo-swiper. 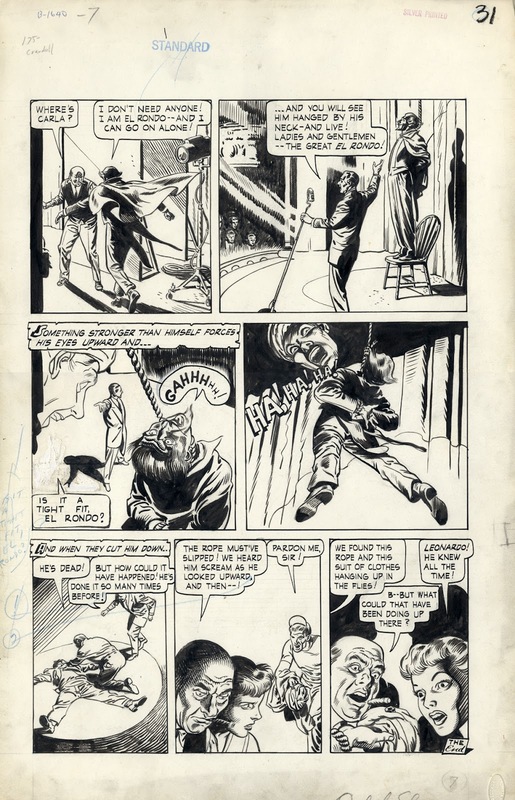 I generally prefer artists who draw more from their imagination, but I like both Godwin and Williamson, mostly for their inking technique, less for their staging which tends to be rather dull. 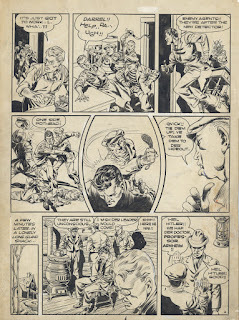 Another Late 80's San Diego Comic-Con purchase was of this Reed Crandall (I assume) Dollman page. Really gorgeous, and since it didn't have any shots of a superhero, I got it for the amazingly cheap price of $400. Or maybe it wasn't a good deal, and I deludedly allowed myself to be ripped off. But I've enjoyed looking at it over the years. 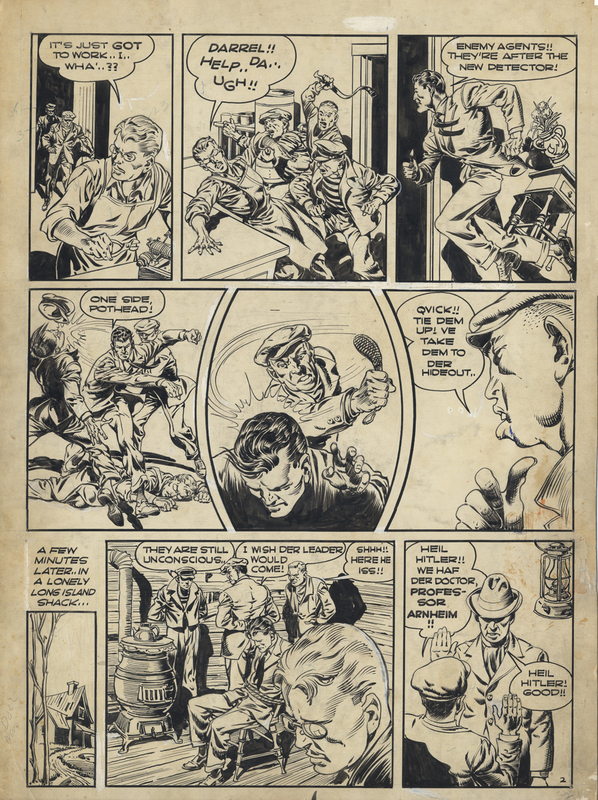 Also, it has a really groovy brush drawing on the back, by Mr. C., I assume, although I've read much of his Golden Age output was inked by others, possibly Chuck Cuidera. I'm posting some new scans of artwork from my collection of other artists. This page is by Russ Manning, one of my favorite artists growing up. 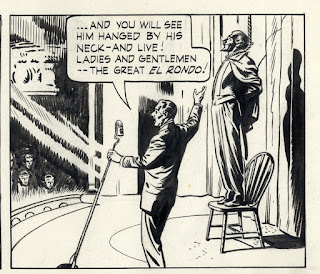 He was one of the first artists who's style I could recognize as a 10 year old (the others being Mort Drucker and Dan DeCarlo). I loved his run on Gold Key's Tarzan series, and his Magnus Robot Fighter series, which this page is from, issue 21 to be exact. 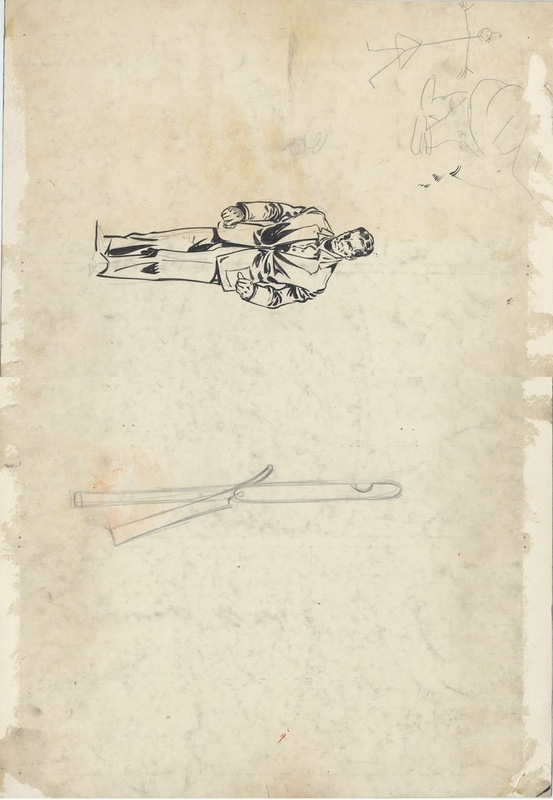 It was one of the first pages of original art I purchased, at my second or third San Diego Comic-Con, back in 1987. I discovered that one could buy really great pages relatively inexpensively if one avoided the "hero" pages and went for the storytelling pages. This is a good example. 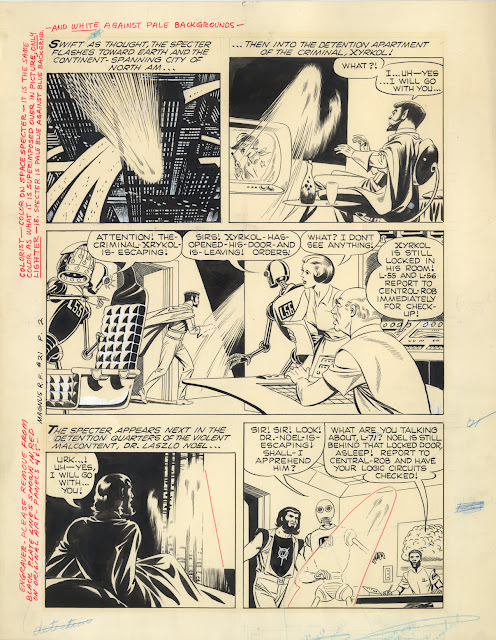 I bought it off a table piled high with Manning Gold Key pages; the ones with the beauty shots of the main character were going for $300+ (if memory serves, which it may not); this page, (I think) cost $50 or $60.